Whether you're working on a layout for a brochure or designing a band poster, establishing contrast is one of the most important things to consider. Contrast is something people are drawn to but it's one of those things that, when done correctly, shouldn't really be noticed. Done incorrectly though and it sticks out like a sore thumb. That's why it's so critical for you, as the designer, to play close attention to the contrast in your designs. Contrast attracts the eye, adds visual interest to a composition and can be in many different forms. 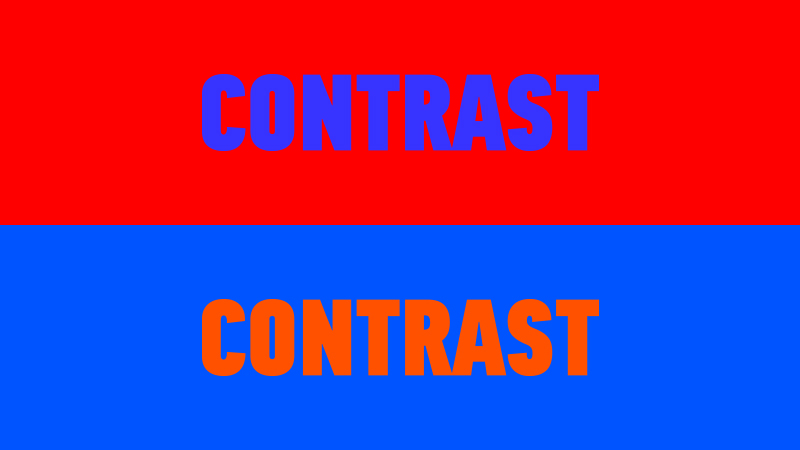 Your first thought may be color contrast such as warm vs. cool and dark vs. light. While color is an extremely essential principle of contrast, there are also things like contrast of type, alignment and size. These different principles all play a vital role in whether or not you have a successful design that's appealing and easy to follow. For you to get a better understanding of these very important concepts, let's go in-depth into each one so you can start implementing them confidently in your next project. In the image below, you can see a very simple example of contrast of size. Your eyes are drawn to the large text. It feels natural; something big beside something small will indicate the big item is far more significant. Having a contrast of size adds visual interest in the composition, and will help you establish the key elements in your layout so you can be sure the viewer is focusing on the right area. 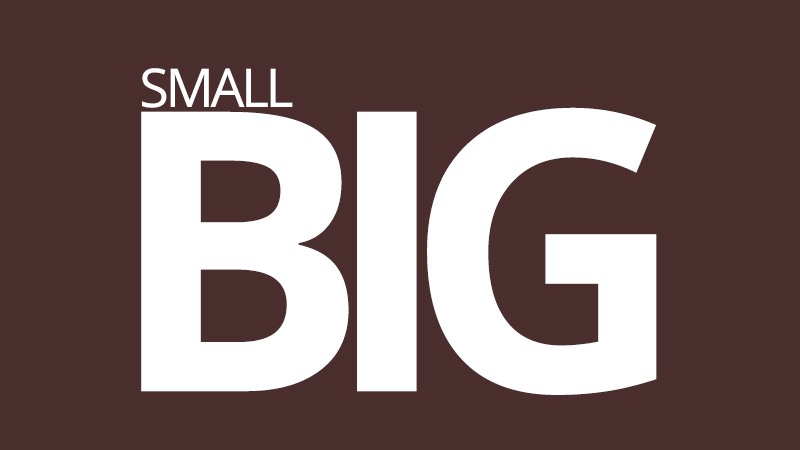 Contrast of size is not applicable to just text; it can also be the images in the design. It's necessary that you find the areas in your design where you want the viewer to focus on. Try to lead the viewer's eye by having a variation in sizes. If your entire layout is comprised of text and other elements all exactly the same size, it'll most likely be pretty uninteresting. This principle is especially imperative if you're working with a very limited palate, because you won't be able to rely on color to help you establish contrast in your design or layout. Contrast of color is arguably one of the key principles of design and, as mentioned before, it's probably one you're familiar with. You can get a very simple example of this theory if you take a white background and drop black text on it. The contrast between white and black values is pretty clear. However, you're probably going to be working with a much larger color palate than just black and white. Establishing the right contrast of colors can make or break your design. You don't want colors to conflict with each other in such a way that it's confusing and irritating to look at. Looking at the image above, your eyes will probably start hurting after staring at it for even just a few seconds. On the other hand, the image shown above here shows a great level of contrast between the background and the text color which is pleasing to look at it. The colors chosen were simply different shades of the previous image, but these work so much better together. It's crucial to work with complementing colors that don't cause strain on the eyes. You also don't want to work with colors which are very similar to each other, like red and orange for example. Utilizing contrast in shape for your designs can really help make things stand out. It'll allow you to make the principal elements of your design stand out by creating a noticeable difference in shape compared to the rest of the elements in the layout. Depending on how far you take this, you can create a very extreme level of contrast to attract more attention to an area. For instance, if you have a layout where all of the elements are made up of rectangles, but right in the middle there's a circle, the viewer's attention is going to go directly to the circle because it's different from the rest of the elements. If you examine the image above, you can see this layout is almost entirely made up of rectangle shapes. The images are rectangles, as well as the different graphical elements. The thing that will probably stand out to you the most, however, is the lamp because it's the only element in the composition that isn't a rectangular shape, and your eye goes directly to that image first. No matter what design you're creating, chances are you'll be working with some type of font. When it comes to typefaces, the other elements of contrast can all be applied, whether it's color, size or shape. When working with a layout, you never want to have the same font used for the entire design. Instead, find places where you can create variation, such as areas are of most significance. For example, you can use the same typeface but have one bold and the other light or regular. This gives you contrast, but also keeps that unification in your design, because you don't want to have a different typeface for every body of text. 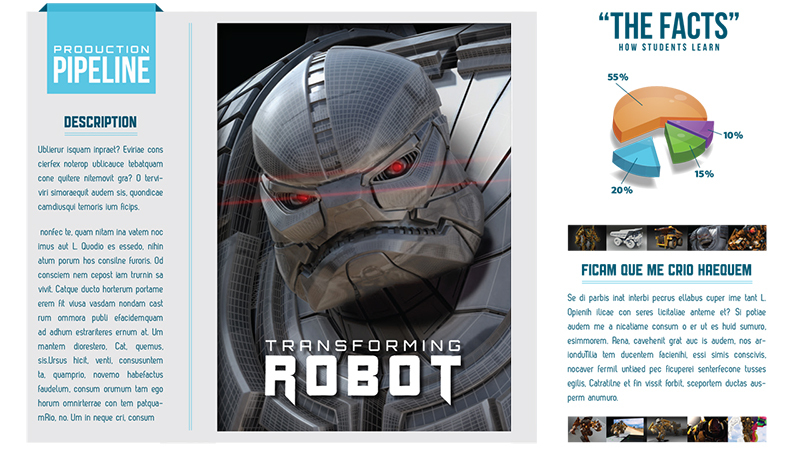 In the layout example above, you can see a great representation of contrast between type. While there's really only two different typefaces used in the design, there's a great contrast between both type and color. 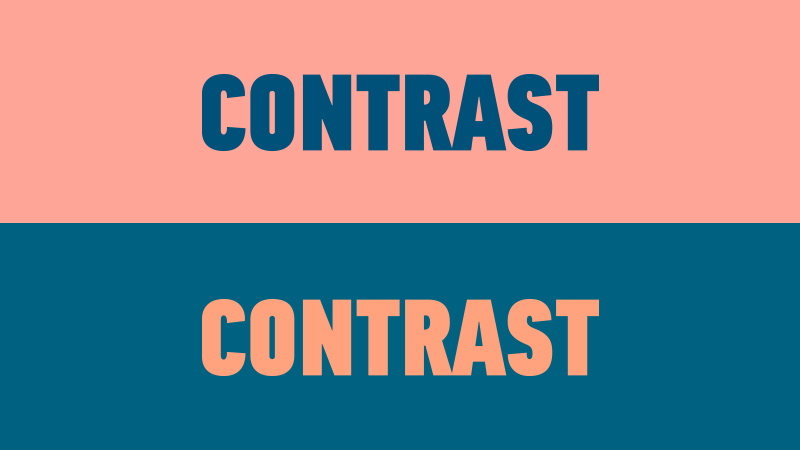 Contrast is one of the most important principles in design, and it goes much further than just light and dark color values. 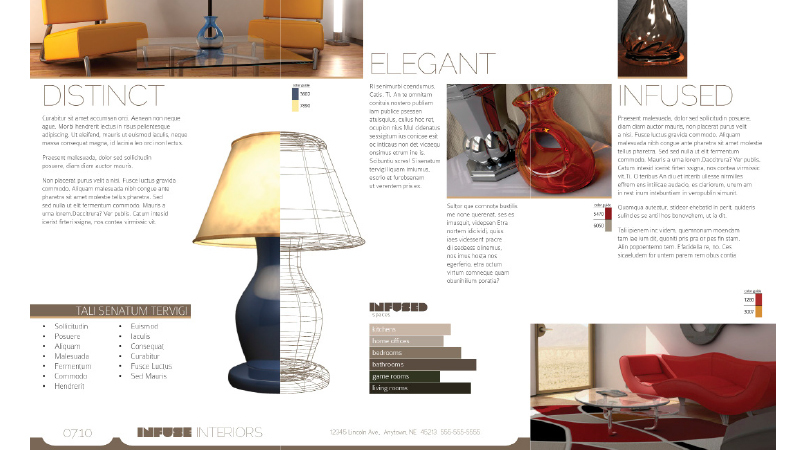 All these elements of contrast should work together in a layout or design to help achieve the final look. Keep in mind that not everything needs a huge level of contrast to where it punches you in the face; it can be subtle. The next time you're working on a layout, make sure you're implementing these principles to create more appealing work. To learn more, watch one of our in-depth InDesign tutorials covering the Principles of Graphic Design and keep learning with more Graphic Design tutorials.